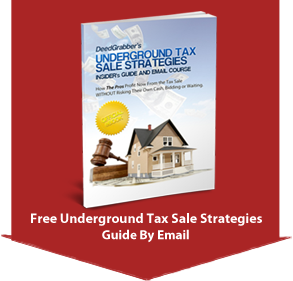 Skip the Tax Sale – Get Better Properties, Faster! How in the world do you get tax sale properties if you skip the tax sale itself? Easy – deal with the owner of the tax sale property before it’s lost to a tax lien or tax deed. When properties first become tax-delinquent, that fact alone does not really indicate the kind of motivated seller we’re looking for. However, it can be the first publicly available clue that a property is in trouble and heading for an eventual tax foreclosure. As always, we can eliminate most properties from our sights because they have a very low assessed value, and are therefore not worth buying at any price. At this stage we will usually also ignore owner-occupied properties where the owner address matches the property address. If there are still too many properties on the list to begin tackling (this can happen in larger counties), we’ll just start with the out-of-town owners. We can further reduce our list by checking for a recent mortgage on the property, if we have the capability to do so. At this point, we’ll mail a postcard to each property that remains on our list after all these cuts, with an “I Buy Houses” message. I also try to send a postcard to the property itself, if the owner mailing address differs. 50-100 postcards sent per week, at a cost of about $75, is enough to keep us busy. We’ll get many calls from these postcards and likely get some deals started. But we’ll really pay attention to the returned mail. If we are getting returned mail from an out-of-town owner, there’s a decent chance we can work out a deal with the owner once we find them at their new address, even though the property may be years from tax foreclosure. It’s nice catching a property early in the process, because we have months or years to make a deal happen before any taxes must be paid. For that matter, near the beginning, hardly any taxes are owed so the taxes don’t represent a big obligation or deduction from our sales proceeds if we resell the property. However, nothing gets deals going like an upcoming tax foreclosure deadline. This may be the date of the tax deed sale, or the expiration of a tax lien redemption period. Once the date comes and goes, our chance to do a deal on this property is gone forever. We’ll go to just about any length to find an owner when we find a vacant property with equity, that is days or weeks from tax foreclosure. At this stage, we can legitimately offer only $100 or several hundred dollars for a deed to the property to the owner – because it is probably their last chance to get anything out of the property. If we have cash to redeem the property, that’s all we have to do to and we can take our time disposing of the property. If not, we need to use a previously created cash buyer list, and find a quick buyer for the property – usually at a deeply discounted price. 3. Property title does not require a quiet title (a procedure required of tax sale auction properties that delays our sale for months and costs extra). So go ahead – avoid the sale and start getting properties today by starting to work with tax-delinquent owners! You generally need to ask the taxing authority (treasurer?) for your county. Don’t take no for an answer from the first person who answers the phone. Ask who conducts the tax sales. how do we find out a house is in preforeclosure ? do they have a pre foreclosure list? where would i find these kind of lists in New Jersey? Search “New Jersey tax sale lists”, especially with a county and you’ll likely find some tax sale lists there. I would like to know where to go to get the tax delinquent properties myself so i can go start buying them myself, so i can start selling them to make extra money myself for my family. Get lists of upcoming tax sales online, and contact the owners to buy them directly from them. The sale will likely have bidding or waiting. Most people don’t know abut it, but you’re forgetting that for every person who has an overage at the sale, there are several who got zero. So it’s not always such a great play to make unless you know what you’re doing. I often keep the property and sell it because I’m guaranteed to make something that way. Other times it’s a complete mess or has title problems and then I’m more than happy to let the tax sale do its thing and try to get an overage. when going through a tax auction list and then go talk to the owner to purchase the home by buying off there taxes. what then happens to the mortgage/ forcloser that is or was on the property? Don’t assume there is one – usually there isn’t and that’s how the property go so delinquent on taxes. how do we go about finding a entire state county tax deed auction properties on one list? Since they are run on the county level, there usually is no such thing. Buying tax delinquent properties – How can I be sure the title, judgment, nuisance abatement, tax, or other liens; encumbrances; easements, covenants; restrictions; boundaries; conditions, and legal status of improvements and appurtenances; other recorded notices, bankruptcy proceedings and all other conditions affecting these properties. Start by asking the owner what they know, and by searching the owner’s name in county records online. If these show nothing, you should get a title report before buying. I am thinking about doing both overage and tax liens.Thank You for the infor mation. What verbiage do you use for the postcards? Just a typical “we buy houses” card – don’t want to show the world they are delinquent on taxes. My local newspaper publishes a list of properties to be deeded to the state because of delinquent taxes. I looked up the names on the list and sent a letter stating that their property was going to to the state. I probably sent out 100 plus letters. I got two replies, which I purchased for $100 each and a quit-claim deed to me. I did a good thing, a lot of people paid their delinquent taxes in time to prevent a hefty penalty had their properties been deeded to the state (much less a lot of red-tape and paperwork). I’ll say! Great job. Hope you make some big money from those properties you got deeds to!